The Med Biodiversity Protection community – led by the PANACeA project – is inviting interested people and organisations to attend an open seminar to simulate Mediterranean debate on ecosystem-based management and biodiversity conservation. The open seminar ‘Empowering the Mediterranean Community with tools for ecosystem-based management‘, which will be held on 16-17 May in Podgorica, Montenegro, is being organised by PANACeA and involves the CPMR and its Intermediterranean Commission. It aims to highlight and transfer the latest knowledge, practical methodologies and tools developed by current EU and Mediterranean research, management and policy projects. The seminar will showcase practical solutions developed and/or tested by the Biodiversity Protection Community in the Mediterranean through research projects, cooperation initiatives, environmental institutions and government programmes. Key players will have the opportunity to present and to learn from each other on best practices to protect Mediterranean ecosystems and biodiversity, with a special focus on the Adriatic region. The seminar will build on the recommendations by participants in the “Bridging the Science, practice and policy gap in the Mediterranean” discussions held in Barcelona in October 2017. The scope of topics to be debated refers in particular to assessing and addressing the challenges of climate change and marine litter impacts on biodiversity and the communities in and nearby protected areas, with particular attention to climate change and marine litter impacts. Other topics to be discussed include testing participatory governance mechanisms for a sustainable management of natural resources and its services related particularly to wetlands and small-scale fisheries, and the meta-analysis of land and sea interactions and economic activities towards integrated ecosystem monitoring and management approaches. Ways to transfer innovative management tools and integrate different data platforms/interfaces in the region will be discussed to strengthen the efforts of this Mediterranean community of projects and institutions to regionally tackle emerging and identified common cross-cutting issues. The developments and tools produced by this community will be assessed against the needs for regional environmental and sectoral policies including the EU MSP, the EU Habitat Directive and the effective management and support to identify priority areas for the enlargement of its Natura 2000 network, the Barcelona Convention and its protocols including the ICZM and the initiative on the de-pollution of the Mediterranean Sea. The open seminar will start on 16 May in the morning and will finish on 17 May 2018 at midday, with a site visit on the afternoon of the first day to Skadar Lake, a Ramsar site and National Park between Montenegro and Albania, as an example of transboundary management towards protection. 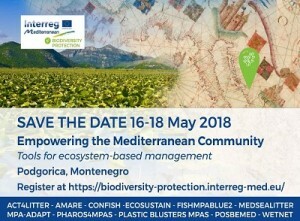 An interactive workshop will follow on 17 May in the afternoon and the morning of 18 May 2018, restricted to the Interreg MED Biodiversity Protection Community and its Advisory Board.